both broadcast and professional utility radio stations worldwide! Today, thousands of professional digital data stations are active on tenthousands of HF frequencies. Cutting-edge technology is used for automatic data transmission over worldwide aeronautical, company, diplomatic, military, maritime, and NGO e-mail networks. Receiving and decoding these stations is far more fascinating than listening to broadcast radio stations. We've been leading in this field for 50 years! Below you will find a few - very recent! - examples of what can be really monitored today. Several hundred screenshots can be found here. 2019 Super Frequency List on CD shows many more details! 2019/2020 Guide to Utility Radio Stations shows many more details! Digital Data Decoder Screenshots on USB Stick gives you more than 17,000 (seventeen thousand!) decoding examples! 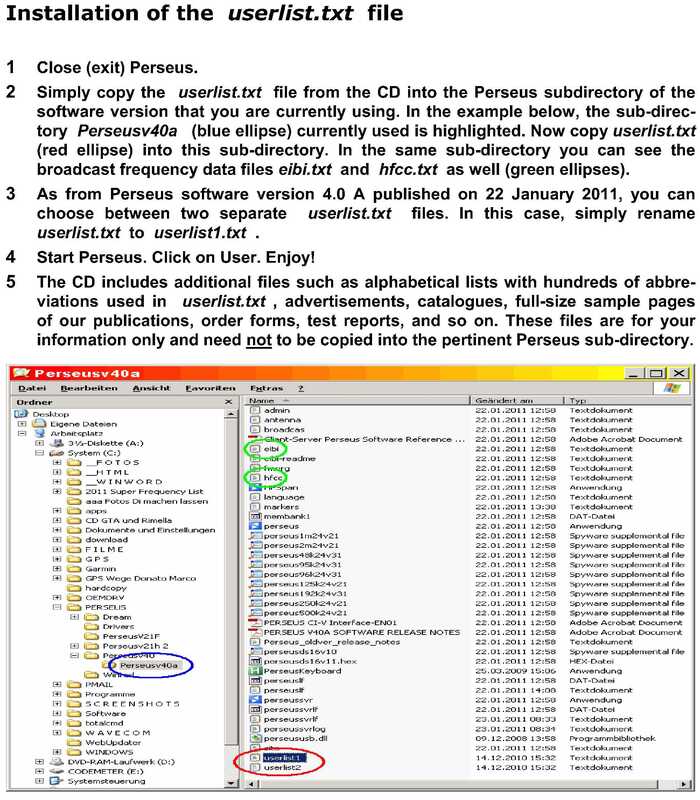 As from Perseus software version 4.0 A published on 22 January 2011, you can choose between two separate userlist.txt files. 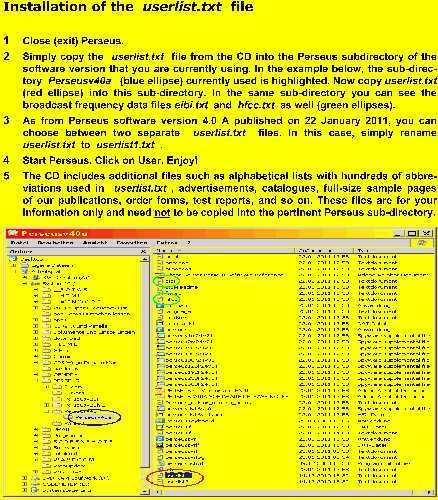 In order to use our userlist.txt file with 4.0 A and later, copy it into the Perseusv40a (sub-)directory, and rename it to userlist1.txt . Now let's zoom on a typical PSK aggregate signal of station FUG on 8454.8 kHz, and decode STANAG 4285 by means of amateur decoding freeware SIGMIRA. STANAG 4285 and similar complex PSK systems are described in detail in our Radio Data Code Manual, the standard international reference book for HF COMINT ELINT MASINT SIGINT. The waterfall display here is 12 kHz wide and shows the complex aggregate and signal propagation fading in full detail. Note also the typical rectangular PSK FFT spectrum in the filter display. Below is a similar transmission decoded with the leading professional WAVECOM W-CODE system for advanced users. Click to enlarge! Another strong PSK signal on 21955 kHz. The 249 milliseconds 1440 Hz prekey tone on 21956.44 kHz, followed by a complex BPSK and MPSK aggregate burst, is clearly visible. This is ACARS, described in detail in our Radio Data Code Manual, the standard international reference book for HF COMINT ELINT MASINT SIGINT. 2019 Shortwave Frequency Guide shows many more details! the utility frequency list does not list the full station name, and essential columns such as Call Sign and Details cannot be fully included. Anyway, our chief programmer has now been able to integrate even the basic call sign column (hereafter highlighted in cyan) with the brandnew 2019 edition of the Perseus frequency database. The following example shows a few entries (actually there are 11 scrollable entries!) of the MEM field for the frequency 8416 kHz. For perfectly edited broadcast radio station lists with a superb and unique ergonomic layout both in frequency and alphabetical order - acclaimed for decades and without any absurd restrictions - please refer to our 2019 Shortwave Frequency Guide. For a perfectly edited professional utility radio station frequency list with full details and exact schedules plus thousands of up-to-date reception times, please refer to our bestseller 2019/2020 Guide to Utility Radio Stations. based on BC2019.XLS and UT2019.XLS, total 13'086 entries! Needless to say, for decades we've used standard international three-letter codes for all countries worldwide defined in ISO 3166 ALPHA 3 and modified for the English language, e.g. AFG BRA GER SAF SPA SWE TAI, avoiding absurd abbreviations such as "AFS", "ARS", "D", "E" et al that are perfectly incomprehensible in today's English-speaking world, and we do use standard two-letter language codes defined in ISO 639 1 ALPHA 2 mnemonically modified for global use, e.g. En Sp Hi Sa Np Ur Po In Km Ku Do Fa as referring to the screenshot above. What's more, our Super Frequency List on CD gives you a total width of 129 characters per line, that is 57 percent more information than a mere 82 characters. Enjoy! The installation of our userlist.txt file is very easy. Click to enlarge! Note that our frequency lists always refer to the centre frequency f0 as internationally agreed, and not to any offset - see chapter 3.1 in our bestseller Radio Data Code Manual. Again, USB is the professional standard setting and there are no amateur "modes" such as "CW", "FAX", "RTTY" et al! This would be our favourite GUI, with the frequency scale in the main window - i.e. the most important parameter at all that is virtually illegible in the current GUI! - dramatically improved. As you can see from the samples above, the PERSEUS LF-HF Software Defined Receiver, with its latest software version, is pretty good. With our proposals implemented - and more to come! - it could be considerably improved for the reception of the really interesting stuff! For less than 1,000 EUR, its technical performance is probably as good as any of those traditional 10,000+ EUR/USD boat-anchor receivers from CUBIC, HARRIS, ICOM, JRC, RACAL, RS, TENTEC, and the like. Complimenti, ragazzi lagiù oltroalpe. È davvero un capolavoro! For professional applications, the combination of a PERSEUS HF receiver and a digital data decoder such as PROCITEC's GO2MONITOR or WAVECOM's W-CODE have drastically revolutionized traditional HF COMINT ELINT MASINT SIGINT working procedures. A WAVECOM located anywhere in the world can be addressed and controlled via Internet. The same goes for the latest versions of PERSEUS et al. What's more, the cost of around 10,000 EUR for one basic radio monitoring post, comprising e.g. a PERSEUS and a WAVECOM, is simply ridiculous. And for the advanced amateur or hobbyist, PERSEUS and WAVECOM are just ... big fun! Here we zoom on HEB carrying a PACTOR-3 variant emission on 4250.5 kHz. The 18 different tones spaced 125 Hz are clearly visible, occupying a total spectrum of 2125 Hz. Here we zoom on the PSK aggregate signal of station IDR on 8151.5 kHz, and decode STANAG 4285 by means of amateur decoding freeware SIGMIRA. The waterfall display here is 12 kHz wide and shows the complex aggregate and signal propagation fading in full detail. Note also the typical rectangular PSK FFT spectrum in the filter display. STANAG 4285 and similar complex PSK systems are described in detail in our Radio Data Code Manual, the standard international reference book for HF COMINT ELINT MASINT SIGINT. Below is the same transmission on 4227.5 kHz decoded with a professional WAVECOM W-CODE system for advanced users. Click to enlarge! Here we can see three totally different state-of-the-art PSK signals within a bandwidth of less than 10 kHz: a STANAG 4285 aggregate on 5311.5 kHz, a Globe Wireless OFDM emission on 5315.0 kHz, and a CIS-12 PSK signal on 5318.3 kHz. Since its introduction in 2009, we've seen that many customers order both our USERLIST.TXT database plus the Super Frequency List on CD. For your convenience, we've introduced a new package deal for both products combined that saves you 10 EUR. For details and even more package deals please see our price list.